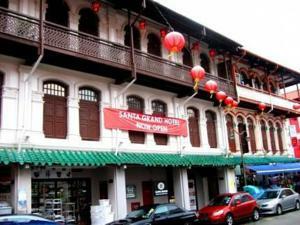 Santa Grand Hotel Lai Chun Yuen is in the heart of Chinatown, a 5 minute drive from the popular Clarke Quay district. The trendy accommodations offer free Wi-Fi access. The air-conditioned guest rooms include a work desk, tea/coffee-making facilities and a flat-screen TV with cable channels. The private bathroom comes with toiletries and a hairdryer. Laundry and dry cleaning services are available. Lai Chun Yuen Santa Grand Hotel is a 20 minute drive from Marina Bay Sands, Universal Studios and Orchard Road. Changi Airport is 13 miles away. Rooms: Hotel Rooms: 80, Hotel Chain: Santa Grand Group. Public parking is possible at a location nearby (reservation is not possible) and charges apply.